My journey through Chantal Akerman’s filmography continues. It is haunting to do this with the knowledge that she committed suicide almost to the day two years ago. I mentioned in my post on Là bas that her pain, her struggle, the weight of the past she had carried with her, was palpable in every frame. Chantal Akerman was open about this, and yet she wasn’t. She made it more (c)overt in her films, I find, than in other circumstances. The texts she wrote were full of references to her mental struggles, and yet it is her films that haunt me most. Akerman is similar to, albeit also very different from, Lav Diaz. The Filipino director equally creates a traumatic universe in this films and plays with presence and absence throughout his long films. Even though I know about Diaz’s own traumatic past, his films are less personal than Akerman’s. Whereas Diaz primarily tells the story of his country, Akerman tells her own story. She speaks about her family and the ways in which her family’s contact with the Holocaust has shaped her. No Home Movie is Akerman’s last film. It is an intimate study of her mother, of herself, and of the relationship between the two. There have been rumours that people booed at the premiere of the film. I do not and cannot know whether those rumours are true. But if they are, they show that some people have little interest in building a relationship with a director and a film. A director is merely a machine creating one entertaining film after another. Film becomes a commodity. No Home Movie is anything but. It is not exactly beautifully shot, it is raw, unpolished. It is a home movie, without actually being one. Some of you might remember old footage of your holidays, when you were little. Our parents or grandparents show us those raw pictures, often utterly unstable which makes it difficult to watch. In the good old times of analogue film, the shaky nature of the home movie image was a classic. The shakiness often became an aesthetic vehicle in order to transmit feelings of joy. Who hasn’t seen those images of children running towards the sea with their arms high up in the air? Or of parents playing hide-and-seek with their children, a smile on their faces, enjoying the leisure, the freedom, the opportunity of being, if only for a little while, a child again. Akerman’s No Home Movie is the opposite of all that. It shows stasis, it shows one woman ageing slowly and another trying to cope with it. The camera is often positioned on a stable surface, such as a table, recording passively what happens in front of its lens. At times we see Akerman herself or her mother in a long shot, framed with the help of door frames, which represent the mother’s apartment in Brussels as a complex labyrinth. The detached camera is a good metaphor of the distance that lies between present life and past trauma. Post trauma, you continue your life, but your life is different from that of people around you. Yours will always be a different life. I remember those painful passages in Akerman’s writing in which she evoked the silence, the detachment, especially of her mother, as a result of the family’s deportation to Auschwitz. I remember those passages in which she spoke about her dad taking her out of Jewish school, of the family ceasing to celebrate Shabbat. They seem to me like consequences of endured trauma and describe the detachment that Akerman’s camera often visually reinforces. These memories surface in No Home Movie, during long sequences of conversations between Akerman and her mother. They are a repetition of her writing. The film is not, as it might look at first, a film about her mother. It is more complex than that. Akerman herself is present in a lot of frames. The conversations with her mother in the kitchen, over a meal, are interesting, are simple and yet have a strong meaning, because they return over and over again to the past. It is a past that has marked Akerman’s mother profoundly, and Akerman herself, although she was not directly affected by the persecution of Jews. Instead, she is the second generation that is known to have “inherited” the trauma of their parents. Theirs is a trauma that is the result of silence on the one hand, but also of overt behaviour of their parents as a result of what they have been through. These traumas can affect three generations, although the third generation (as is the case with myself) approaches this trauma from a different angle. Something that struck me is how relatively open those conversations between Akerman and her mother were in the film, knowing that there had been a difficult silence in the past. What the film shows is something I see in my own family; the older my grandfather get, the more he speaks about his trauma. It is as if they want to unburden themselves in order to be able to rest in peace, literally and truly. No Home Movie contains, I find, a radical break after an hour. The first part of the film is a study of Akermans’ interactions with one another. They’re almost sweet, those scenes when Akerman films her mother while being on Skype with her. When her mother asks why she is being filmed, the director responds so lovingly, heartfelt: “I like filming people, but you more than anyone else.” Or “Because I want to show people that there is no more distance.” It is affectionate, a gesture that seems so personal, and yet it is there for all of us to see. The second part is a shift towards showing the last days or weeks of Akerman’s mother. The film loses its dynamic (on the level of character interaction) and becomes a slow, almost static portrait of an old woman eating less and less; sleeping more and more; remembering less and less; being confused more and more. This intimacy has certain similarities to Wang Bing’s Locarno winner Mrs Fang, which I reviewed not so long ago. No Home Movie doesn’t go quiet as deep, but one cannot deny that these two films have in common their focus on the process of dying, of saying goodbye. In Akerman’s film, this goodbye is twofold, which gives this film a ghostly appearance. The director had said that her films were about her mother and if her mother was to die, there was nothing left for her to say. With her mother’s death, her filmmaking had lost its raison d’être. It pained me to see the final shot of the film; alone, she closes the curtain in her mother’s apartment and remains in a dark room. It stands in stark contrast to what the film felt like at the beginning. There were scenes of her driving, perhaps aimlessly, through austere landscapes, leaving the sound unpolished. Akerman wasn’t present in those shots. She focuses instead on the vastness in front of her, of the emptiness, but also of the absolute freedom that a landscape such as this can offer. In the end, stasis and death prevail. Darkness becomes a veil and a shadow that, I find, wasn’t (visually) as present in the films I had watched previously. No Home Movie is no home movie. It is Akerman’s personal farewell; a farewell to her mother, to film, to the world. A striking last film whose images and conversations will stay with me for a long time. I’m slowly but surely diving more into Chantal Akerman’s filmography. I believe that her work contains a lot that I have been interested in throughout the past years, and it might be worth looking at it in more detail over the coming months and years. 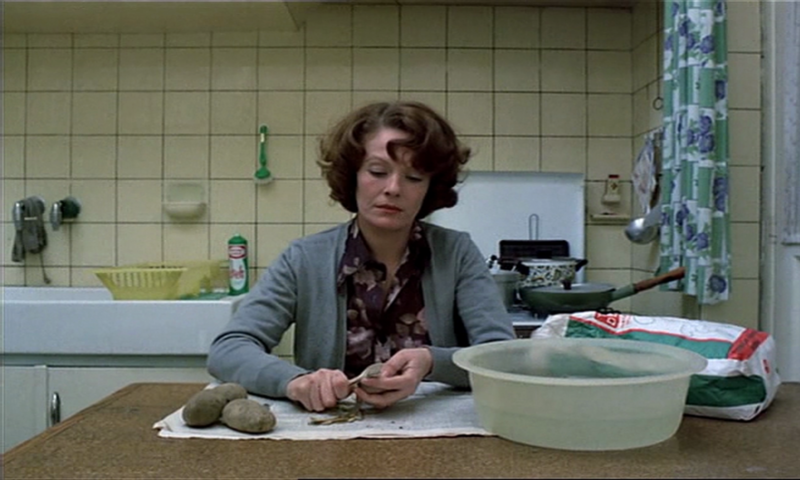 News from home , released in 1977, is a sort of follow-up to Jeanne Dielman 23, Quai Du Commerce, 1080 Bruxelles (1975) in that it continues to follow Akerman’s contemplative aesthetics. In some ways, it is a soothing film. The images of New York in the late 1970s are accompanied by a voice over of Akerman herself, reading letters she had received from her mother. The concept is very simple, but effective (affective?). While we see images, often via a static camera, of cars driving up and down the streets of New York, or people walking the streets, or even people in diners as seen through windows, we hear the written words of Akerman’s mother, always worried, always concerned, always tired. She speaks about her health, needing medication again and again, and the difficulties they have with their shop in Belgium. It appears to be quiet, and Akerman’s mother often evokes that she’s either bored at work because nothing happens, or anxious precisely because of this. It means tighter finances. And yet, she makes a great effort at supporting Chantal in her adventure in becoming a filmmaker in the US. She sends money and clothes, always anxious whether her letters or packages are received. The voice over is often drowned out by noise in the streets or in the metro. You try to listen, but there is little point. You can catch mere glimpses of what is said, if at all. It is realism that Akerman attempts to pursue here. Cities are noisy, cities are loud, deafening the people who live in it. We become accustomed to it and no longer notice it…until we spend a few hours in the countryside. The approach of letting the spoken word disappear in the noise of city life is very poignant, especially given that the film was made in the late 1970s and it’s so much worse today. I became very quickly an admirer of Akerman’s shots in the metro stations; beautiful and enigmatic, just like life. What these shots meant to me was much more complex than what the actual images show. These images are images of time, and not just of slowness, but of time the way Chinese, for example, see it. Time not as consisting of only a single pace. Time is complex. Time consists of slowness and speed, of emptiness and fullness, of idling and of doing. At those metro stations people come and go. They wait for the next metro that takes them to another place, that takes them through space. We see them wait, we wait with them, and at some point the metro comes rattling into the station. It’s speed that we perceive. People leave the metro cars, people enter the metro cars. It’s bustling for a few second, and then everything quietens down again. Slowness and speed…the complexity of time portrayed in a single shot. There is another aspect that I became aware of, and I’m unsure whether this has been written about before. If someone were to ask you what the film was about, what would you respond? We can all describe the film, describe what we see. But what is the film about? Perhaps this isn’t important. At the same time, the indistinct feeling , this not so very clear orientation of where we should go, again speaks for complexity in simplicity. Did Akerman make a film about New York at the end of the 1970s? One gets a glimpse of life in the city throughout the film’s running time. Did Akerman make a film about her mother? Maybe. Her written words are the images’ second layer. They give a characterisation of Akerman’s mother, but perhaps also of any mother, worried about a child abroad, in a big city, far away. Did Akerman make a film about herself? That is possible, too, especially if one considers that she herself is involved (via voice over), reading personal letters she has received and filming the city she now lives in. Did Akerman make a film about us? Maybe. Everything is possible in this film. Akerman keeps it simple but open. It’s a film that wasn’t finished by herself or the editor. It is finished when it meets its viewer, and when the viewer decides what s/he sees, what s/he wants to read into the images before his/her eyes. Only then News from Home is complete. Only then do we see just how complex simplicity can be. I’m on a Wang Bing roll at the moment. I have finally found the time to see his work, and all kinds of things run through my head at the moment. Ta’ang, un peuple en exil, entre Chine et Birmanie is Wang Bing latest film. Again a documentary, a form of cinema he is specialised in. Again, it is a political film. Again, he gives those on the margin of society a voice. In Ta’ang I can see his patience for just being with his “subjects”, for listening, for waiting. And I haven’t even seen his 14-hour masterpiece yet. Ta’ang is part of a growing work on refugees. Only recently have I seen the Berlinale winner Fire At Sea by Italian director Gianfranco Rosi, a film set on the island of Lampedusa. There is also Mediterranea by Jonas Carpignano which comes to mind, equally a depiction of refugees in their search for a safe place, away from war, away from oppression. There is a refugee situation over on the other half of the planet, too, but this is hardly ever mentioned in our spheres. Wang Bing’s new film, as one example, is a look into a fraction of what is happening daily on the border between Burma and China. Wang very much relies on our interest and openness. Similar to Lav Diaz, he gives us very little background information about what we are about to see. There is a short text at the beginning of the film, but it gives us the basics. Nothing more, nothing less. If you want to engage with the film, you need to do more than see the images. You see what you know, it is said. If you don’t know anything about the Ta’ang, the images will give you little information about them. They are, as I have already noticed in Wang’s Fengming, rather dispassionate. The director refrains from framing scenes in a certain way in order to make you feel something. I could be wrong, of course, but I can’t help the feeling that this is the most neutral documentary I have ever seen. Nothing is ever entirely neutral. Not even a documentary, which, I believe, is supposed to show its subject unbiased. But Ta’ang gets pretty close. Wang and Diaz are very much alike, but the bias is one thing which differs in their films. I see this clearly only now that I have dived into Wang’s films. In certain cases, such as parts of Death in the Land of Encantos (2007), Diaz follows a very similar path. He tries to be as objective as possible. As he said in an interview somewhere, he wanted to be journalistic in his depiction of the aftermath of typhoon Reming. But he did construct a feature film around the event in the end, which has implications on how the viewer reads the material. And then there is a shot in From What Is Before, a low level canted angle, something I had never seen before in Diaz’s work. A canted angle is never neutral. You won’t find this in Wang’s Ta’ang. The camera tends to be on eye-level with the subjects it films. There aren’t any fancy aesthetics. If you love the photographic frames in slow films the way I do, you will be put off by the film’s look. But this brings me back to what I thought was important in terms of Fengming and her testimony: every aesthetical decision is an ethical decision. Rosi’s Fuocoammare aetheticises suffering and death. This isn’t the case with Ta’ang. You won’t find pretty frames. You won’t find something aesthetically pleasing. Wang shows the situation as it is: dirty, ugly, a disgrace. The Ta’ang are forced into nomadism. They left their homes in winter 2015 as armed conflict broke out in the border region between Burma and China. What we see is their daily life. These refugees either sit and wait in makeshift tents until they can go back home. Or they move from one supposedly safe place to another all the while we hear gunshots and artillery fire in the background. I would say that a good half of the film is set at night, around a camp fire or candles. Or even torches. Maybe it only felt as if half of the film was set in the dark. Which brings me to an interesting difference between Wang and Diaz. Ta’ang‘s two-and-a-half hours feel incredibly dense. It felt more difficult to sit through them than through eight hours Lav Diaz. I had a similar impression after Diaz’s Storm Children which was much shorter than his usual film work. But it was a documentary, and an over two-hour long documentary without even a loose narrative but a simple depiction of daily life puts your patience to the test. This isn’t a bad thing at all. I find it quite an interesting thought that feature films are easier to sit through. We’re habitual people. We’re used to a narrative. To sit through eight hours is hard work, but as long as there is a narrative that progresses and you have something that vaguely resembles a three-act structure, it is doable. As I keep saying, for most Lav Diaz films I didn’t mind the running time at all. Wang Bing seems to be a wholly different arena in my slow-film engagement. His films seem to come even closer to real life, both in terms of time and story. Besides, you’re stuck with the images of, say, a woman boiling potatoes. Because Wang does not focus on pretty shots, there is nothing you can admire while the actual action happening in front perhaps bores you. You have to stick with it. Several slow-film directors give you this “escape”, if you need it. Wang forces you to be with the characters, to be with their plight. I start to become a fan of Wang’s work. His films are challenging, more than other slow films I have sat through. But this is precisely why they make me curious. Again, just as with Diaz’s work, I’m not sure I’ll be able to explain what I feel intellectually, but there is something that I’ll try to follow the next time I’m watching a Wang Bing film. There is something somewhere. I just don’t know yet what it is.